Fuego volcano Guatemala, eruption updates: multiple ash "puffs"
Fuego volcano continues its moderate strombolian activity; INSIVUMEH reported frequent explosions such as on 10 October that produce ash plumes rising to to altitudes of 4-5 km (13,000-16,400 ft) a.s.l. and mostly drifiting N and NW. The explosions are often accompanied by rumbling noises and jet-engine like sounds. Avalanches of collapsing spatter from the growing cone in the inner crater descend W into the Taniluyá and Santa Teresa ravines. Last evening (August 8, 2007) Fuego produced a spectacular eruption as seen from Antigua. Apparently the resulting flow of lava, etc., was primarily down the south and west flanks, the opposite side from Antigua. There appeared to be some lava flow down the eastern flank, but it was difficult to be certain, as there were clouds obscuring the view. We first became aware of the eruption at around 6:45, but it may have been in progress for some time. It continued until at least 10 pm Guatemala time, but at that time either stopped or was too obscured by clouds for us to see continued activity. Strombolian activity at Guatemala's Fire Mountain "Fuego" remains high. INSIVUMEH reports exposions of typically 50-100 m height, although sometimes stronger explosions, such as one on on 1 July throw lava to up to 300 m.A new lava flow, about 250 m long, and headed towards the Río Taniluyá river had started on 27 June from the secondary vent. The older flow, mostly active in March-April, originating from the summit crater, continues slowly as well.  Two lava flows are active at Fuego volcano, travelling through the Santa Teresa and Taniluya ravines, 200 and 500 m long. Strong turbine-like noise from degassing at the crater is audible. Fuego volcano remains in a relatively active phase with strong stromblian activity. Ash plumes from explosions reach 4-5 km altitude and occasional ash fall occurs mainly in areas SSE and W of the cone. Activity at Fuego seems to be increasing. INSIVUMEH reported on 9 and 13 March that explosions from Fuego produced ash plumes that rose to altitudes of 4-4.2 km (13,000-13,800 ft) a.s.l. and drifted SE. Rumbling noises were heard from surrounding villages. Lava flows extended ~100-150 m W toward the Taniluyá River valley and avalanches occurred from the lava-flow fronts. On 12 March, incandescent material was ejected about 15-20 m above the central crater. INSIVUMEH reported that explosions from Fuego produced white and gray plumes that rose to an altitude of 4 km (13,000 ft) a.s.l. and drifted SW on 12 January. Incandescent material was propelled up to 75 m above the summit and incandescent blocks rolled W towards the Taniluyá and Santa Teresa ravines on 12 January and S towards the Ceniza ravine on 12 and 16 January. Based on information from the Tegucigalpa MWO and satellite imagery, the Washington VAAC reported that a faint plume was seen on 12 January drifting W.